by: Ashley Maltz, M.D., M.P.H. and Pamela Wible, M.D. On May 10, 2016 we lost another bright, young soul to suicide. Sean Petro was in his third year at the USC Keck School of Medicine and is the third tragedy at his school in the last two years. On April 23, 2015, we lost Kevin Dietl to suicide just weeks before he was to graduate medical school. Kevin's parents were so excited to attend their son's graduation. Instead they attended his funeral. What's being done to prevent the next suicide? How many more students must die? RSVP for the National Day of Solidarity to Prevent Physician Suicide. View the Do No Harm film trailer that exposes this suicide crisis. Medical student and physician suicide is an epidemic. It is estimated that 400 doctors die by suicide in the United States each year. That&apos;s the equivalent of an entire medical school gone! The second leading cause of death among medical students is suicide—a well-known occupational hazard in medicine. Yet no medical organization is tracking these suicides. Why? And how can we solve a problem when it&apos;s hidden from us? The AAMC (Association of American Medical Colleges) and ACGME (Accreditation Council for Graduate Medical Education) claim to improve the health care of all through serving the academic medicine community and advancing the quality of physician education. How can this be acheived while ignoring our own epidemic of medical student and physician suicide? View TEDMED talk on physician suicide. The fact is we enter medicine with our mental health on par with or better than our peers. Medical training can be dehumanizing. Fear-based teaching methods often prevail. Public humiliation, bullying, and sleep deprivation are commonplace. Those who seek help often risk punishment and loss of their careers. Mental health is stigmatized within the medical profession to the detriment of all. As physicians who are dedicated to caring for the physical and mental health of others, we&apos;re appalled at the level of inaction among our own organizations when it comes to caring for us. Please sign this petition to urge the AAMC and ACGME to track medical student and physician suicides, to enact policy requiring medical training programs to take concrete actions to combat the culture of abuse, and to offer routine and confidential on-the-job psychological support to all medical students and physicians. On May 10, 2016 we lost another bright, young soul to suicide. Sean Petro was in his third year at the University of Southern California Keck School of Medicine and is the third tragedy at his school in the last two years. On April 23, 2015, we lost Kevin Dietl to suicide just weeks before he was to graduate medical school. Kevin's parents were so excited to attend their son's graduation. Instead, they attended his funeral. What's being done to prevent the next suicide? How many more students must die? As physicians who are dedicated to caring for the physical and mental health of others, we&apos;re appalled at the level of inaction among our own organizations when it comes to caring for us. We urge the AAMC and ACGME to track medical student and physician suicides, to take concrete actions to combat the culture of abuse, and to offer routine and confidential on-the-job psychological support to all medical students and physicians. Inaction and ignorance are no longer an option. Lives are on the line. This is a public health crisis that impacts us all. Ashley Maltz, M.D., M.P.H. and Pamela Wible, M.D. Join doctors, students, family, friends, and Care2 members across the country on August 20th for the National Day of Solidarity to Prevent Physician Suicide. Learn more and RSVP here. Come listen to speakers from the medical community share their experiences, observations, and ideas for how to combat the suicide epidemic. And join us as we remember those who have lost their lives to suicide during the event’s closing candlelight vigil. Please make a donation so that Do No Harm, a documentary film exposing the physician suicide epidemic, can be completed. 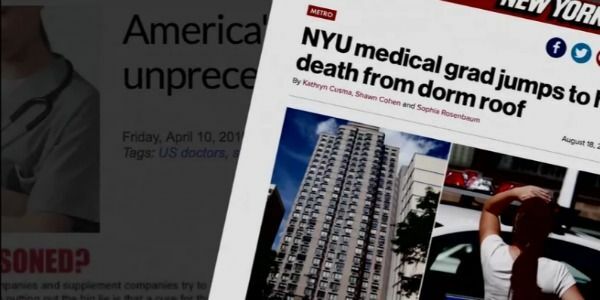 The film weaves intimate stories of suicidal doctors and grieving families with statements from the ACGME, AAMC, and AMA leaders confronted with why their organizations aren't doing more to protect doctors. The film also features the delivery of this petition. So please donate today. Lives are on the line and every dollar counts. We just delivered the petition to the ACGME and AAMC leadership, and both organizations have stated that the suicide epidemic within the medical community is a serious problem that they want to address. They're still working out what to do, so please keep sharing this petition with your friends. We are also planning a National Day of Solidarity to Prevent Physician Suicides on August 20th in cities across the country. To get involved, please email Lacey Kohlmoos at LaceyK@Care2team.com.